I live in the heart of Denver. Although I live at least 30 minutes from any area I would describe as "wooded or rural," I regularly glimpse raccoons, foxes, coyotes, and of course, squirrels, and all kinds of bugs and birds, when I am out working in the yard or walking my dog. 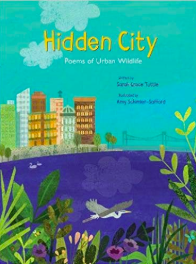 In HIDDEN CITY: POEMS OF URBAN WILDLIFE debut poet, Sarah Grace Tuttle celebrates the wildlife of the city. In her poems, readers find all kinds of animals- including mice, skunks, sparrows, and several kinds of insects, as well as plants like mushrooms, moss, and wildflowers. Tuttle has a dual degree in English and environmental studies, and as someone who loves a few facts with her poetry, I love the information she embedded in each poem, as well as the followup endnotes, "Fun Facts About the Wildlife in These Poems." Readers of HIDDEN CITY learn to watch carefully for the natural wonders in their own world. I could see reading the poems and then heading out with writers' notebooks to capture the wonders that we might find. Kids could definitely use the poems as mentors for their own wildlife/nature poems. Artist Amy Schimler-Safford is an illustrator that is new to me, but her collage artwork is perfect for the poems in HIDDEN CITY. for their long winter sleep. a feast spills out of the bin. I'm looking forward to sharing this book with students in my urban setting.